Douglas College's New Westminster campus came alive with dancing, music and booths for International Day 2013. The fun and educational event gave students a chance to experience the sights and sounds of cultures from around the world. Check out this video of all the excitement. 1. Do a practice exam. Try and predict the questions you will be asked, and answer them. 2. When you begin studying, highlight everything you already know. You'll be encouraged at seeing how much you've already accomplished. 3. Don’t stay up too late to study. It’s OK to pull an all-nighter for a paper, but with a test, you need the energy the next day to actually take the test. 4. Study the easy stuff first. That way you don’t waste all of your study time on one difficult concept and run out of time for the rest. 5. Make your study time fun, short and interactive. Use flashcards with pictures, colours and highlighters. 6. Turn off the Internet. Facebook will still be there when your study session's over. 7. Look over your in-class notes to see what information the instructor spent time on and what might be more important to study. 8. Snack smart: eating foods such as bananas and nuts while studying can actually help you retain information. 9. Drink water before your exam. Research has shown that downing the wet stuff before a test can improve your performance by up to a third. 10. 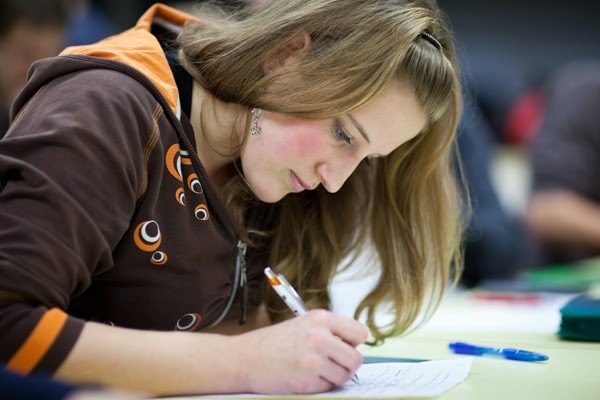 Visit the Learning Centre to work with a one-on-one peer tutor. It's free. Look for details on the centre's website. There’s more to becoming a Dispensing Optician than just learning how to fill contact lens prescriptions or ensure eyeglasses fit properly. At Douglas College, it’s also about understanding the value of using your skills and knowledge to give back to the community. 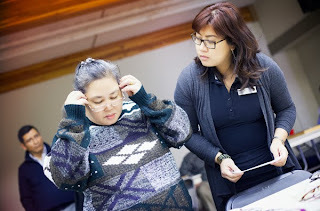 Students in the Dispensing Optician diploma program take part in several volunteer initiatives focused on helping people in need with their vision care problems. Among the volunteer initiatives, students help provide prescription eyewear to people at a drop-in centre in Vancouver’s Downtown Eastside. They also work with a local ophthalmologist to provide people with glasses during a day of eye exams at a Port Coquitlam church. “We want students to understand the importance of being involved in the community and we hope that once they graduate that they’ll continue to do so,” Mullen says. More information about the Dispensing Optician program is available here. This week at Douglas College: concerts, movie night, info session and more! Learn about Italy Field School for Summer 2014. More info here. The DSU Ski and Snowboard Club is hosting a movie night and general meeting. More info here. Enjoy Music for Winds from Across the Globe. Free admission. More info here. Enjoy the Student Showcase Concert as part of the fall Arts at One Concert series. Free admission. Open to public. More info here. Job search essentials. Learn how to network, access labour market information and more. Enjoy Student Composition Concert, featuring newly composed works by Douglas College students. Free admission. More info here. Got an event you want listed? Submit it here. See more upcoming Douglas College events on the Events Calendar. 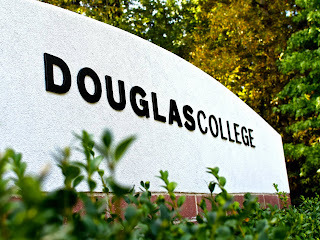 And make sure to join Douglas College on Facebook and follow us on Twitter! Members of the Douglas College Dream Team. A smiling group of participants and volunteers—as well as some eager canines—gathered in New Westminster's Queen's Park for the 3rd-annual Douglas College Miles for Mental Health Walk/Run. In crisp and bright fall weather, people took to the 5-kilometre run route and 2.5-km walk route along the forested Millenium Trail. The Nov. 16 event was organized by the Simon Fraser branch of the Canadian Mental Health Association to support the group's work in the community. 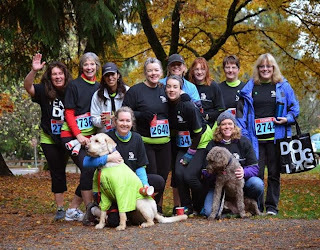 "What an uplifting experience it was to run and walk with colleagues in an effort to end the stigma and bias that surrounds those individuals experiencing mental health challenges," says Anna Helewka, with the Douglas College Psychiatric Nursing department. "Seeing so many people walking and running for this cause gave us all some hope that we can make a difference and that we will realize our dream for a change in societal attitudes towards mental illness." Douglas College is a proud sponsor of the event and a group of employees from the institution took part. Ian MacKay’s passion for international humanitarian work has taken him places many wouldn’t dare visit. 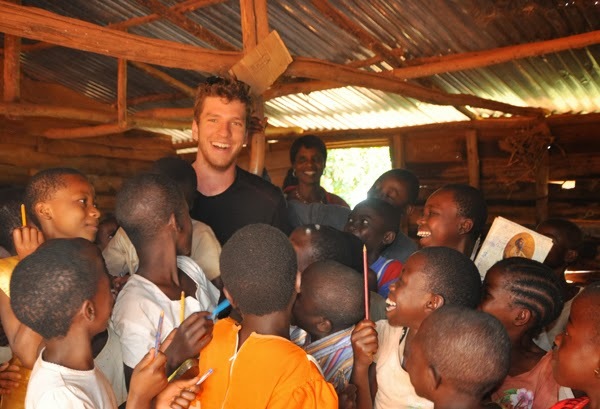 In recent years, the Douglas College student has travelled on his own multiple times to earthquake-ravaged Haiti and the war-torn Democratic Republic of Congo. He admits he faces danger and uncertainty during the solo trips, but explains he goes because he wants to help out where the need is great. Ian, who is studying towards a Bachelor of Science in Nursing, had his first major experience with humanitarian work in Haiti, an island country in the Caribbean. He worked alongside healthcare professionals following the country’s devastating 2010 earthquake and later returned amid a cholera outbreak as a medical first responder. It was while in Haiti that Ian also became interested in the Democratic Republic of Congo. He met a doctor from the African country who invited him to visit her homeland. Ian took his first trip there in 2011. He spent a month meeting people and travelling through the eastern part of the country, a region plagued by rebel groups and armed conflict. For Ian, the threat of violence was a part of daily life. During the trip, Ian met Tom Amani Mataboro, a local educator who shared his hope of one day building a school in his eastern Congo village. Inspired to help bring the dream into reality, Ian returned to Canada and launched the Peace Life Project Foundation. The nonprofit group’s goal is to build a school to help educate and empower Congolese children affected by conflict. “A large majority of the population in Congo is youth. Change comes from a grassroots level, by educating the youth. It is through education that we hope to see a decrease in conflict and violence,” says Ian, who also visited the country in early 2013. With planning on the school project under way, it is only a matter of time before Ian returns again to the Democratic Republic of Congo. The Peace Life Project Foundation can be reached by email and found on Facebook. 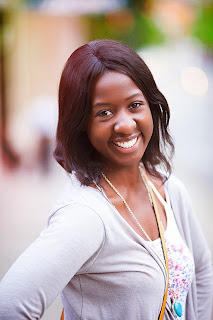 Keneisha Ormsby wants to do her part to erase the stigma around mental illness. A graduate of the Community Social Service Work program at Douglas College, Keneisha is employed as a full-time mental health worker in Surrey. Keneisha, who was born in Jamaica and grew up in Surrey, originally wanted a career working with youth. But she changed her mind when she completed a practicum at a mental health facility as part of the two-year diploma program. In her current job, Keneisha works for a non-profit organization that provides life-skills training to clients with serious mental illness. The goal of the program is to help them transition to independent living. As for the future, Keneisha says she is happy working in the mental health field and plans to pursue a bachelor’s degree in social work. More information about the Douglas College Community Social Service Work program is available here. Student-gamers enjoyed a buffet of fun entertainment during a Games Expo held at the Douglas College New Westminster campus on Nov. 14. There was plenty of friendly competition in videogames, billiards, puzzles and more. Check out this video of the action. Ernie isn’t kidding. As a member of the Sucker Creek First Nation (which makes him Cree), from northern Alberta, Ernie is proud of his heritage and culture. It’s a background he draws upon in his work as an Aboriginal support worker for the Langley school district, where he is posted at a middle school and with an alternative program for youth. Ernie came to Douglas to study Child and Youth Care, but then discovered Co-occurring Disorders, a program that provides specialized training for social workers and health care professionals in dealing with clients battling mental illness and addiction concurrently. Earlier this year, Ernie earned an Advanced Citation in Co-occuring Disorders. He says the program opened his eyes. “The Aboriginal population is diagnosed with a lot of mental health issues, and they seem to self-medicate, so that's where the alcohol and drug issues come in,” Ernie says. 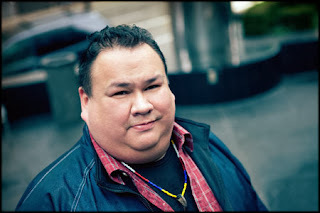 “Poverty, colonization and the residential school experience – all of these weigh heavy on Aboriginal people, many of whom are street-entrenched. But things started to change for Ernie when he was 17 and living on a boys’ ranch in Alberta, a tough place far from the city on the open prairie that had no fences, as there was nowhere to run to. One day there was an electrical fire in the barn that killed most of the animals, leaving behind 12 newborn goats. The youth workers gave them to the kids to take care of. Ernie was charged with two. Shortly thereafter, Ernie moved back home with his mom and started volunteering at the local friendship centre, where his mom was executive director. It took a few more years for Ernie to get his alcohol consumption under control. Ernie is also continuing his studies at Douglas College, pursuing a degree in Child and Youth Care. His main goal is helping vulnerable Aboriginal people gain back their independence, dignity, and a healthy mind and soul. This week at Douglas College: International Day, info sessions, concerts and more! Learn about the Disney International Academic Exchange Experience Program. More info: Study Abroad. Every year Douglas College proudly celebrates the tremendous diversity of our students, faculty and staff on International Day. More info: Douglife website. Learn about Italy Field School for Summer 2014. More info: Field School. CPA information session for accounting students presented by the Douglas College Business Association. Enjoy the Student Showcase Concert as part of the fall Arts at One Concert series. Free admission. Open to public. More info: Arts Events. Inclusion BC, with the Family Support Institute and Douglas College, will announce the results of their provincial survey on restraint and seclusion, and hold a viewing and discussion of the film “Restraint and Seclusion: Hear our Stories.” More info: Inclusion BC. Douglas College choirs in concert. Featuring the Douglas College Choral Society, Chorus and Chorale. Admission $15, seniors $10, students free. More info: Choral Society. Earlier this year, three Health Sciences students represented Douglas College at the Education Without Borders Conference in Dubai. Check out this video about their experience. Education Without Borders conference footage courtesy of Higher Colleges of Technology. Want some friendly company when you walk at night between the New Westminster campus and the SkyTrain station? 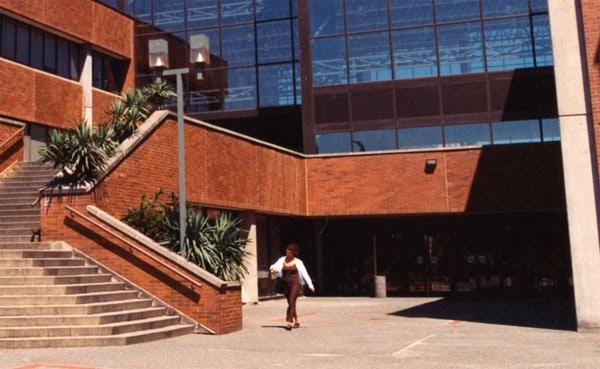 Douglas College is piloting a SkyTrain Safer Walk program for students and employees heading to the New Westminster SkyTrain station. From Monday to Friday, Nov. 4-Dec. 16, students and employees will be offered optional escorted trips to the station by a uniformed security officer. 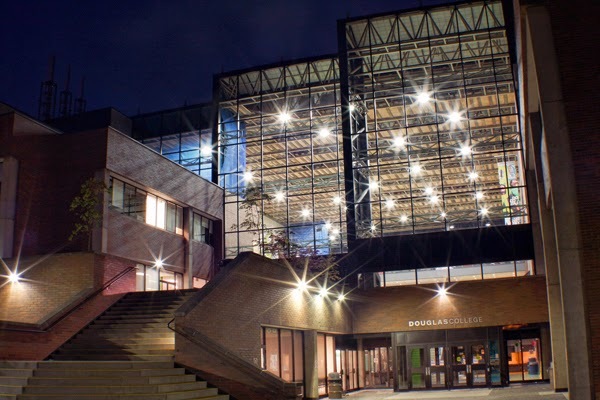 The walks will depart every 30 minutes from 7pm to 11pm, leaving from the SkyTrain Safer Walk table in the College’s main concourse near the West entrance of the campus. Douglas College will gather feedback and review participation levels during the trial period in order to gauge the program’s popularity and effectiveness. This week at Douglas College: Film screening, Diwali celebration, games expo and more! UBC Sauder School of Business visit. Check a screening of the film Status Quo? The Unfinished Business of Feminism in Canada. Stay for a discussion lead by the Douglas College Women’s Centre. Registration starts for Winter 2014 Semester. Aboriginal student funding info session. Find out how to pay for college. More info: 604 527 5821 or email. Want a chance to win $100 to Metrotown just for playing video games and board games? Then come relieve some exam time stress at the Games Expo and race your friends, smash your friends, or dance with them for a chance to win. More info: Douglife website. The DSU Punjabi Students’ Federation brings the party DIWALI’13 to Douglas College students. Tickets $10. Come participate in the 3rd-annual Douglas College Miles for Mental Health Walk/Run. More info: Doug blog. Poem of the Month showcases outstanding work written by Douglas College students. Each month, the Creative Writing Department displays posters across both campuses featuring a new poem. 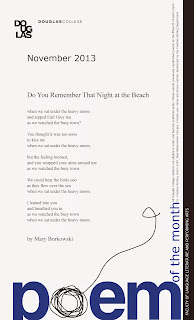 Click on the image to the right to see an enlarged version of this month’s poster, featuring "Do You Remember That Night at the Beach” by Mary Borkowski. All Douglas College students are eligible to enter the Poem of the Month competition. Featured poems are selected by a committee of instructors. To learn more about submitting poems, contact the Faculty of Language, Literature and Performing Arts at 604 527 5465. 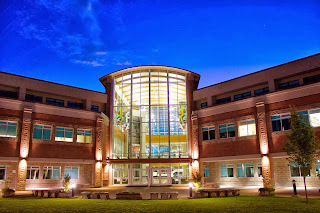 More information about the Creative Writing Department is available here. Bruce Biro knows what it’s like to make a difference in people’s lives. 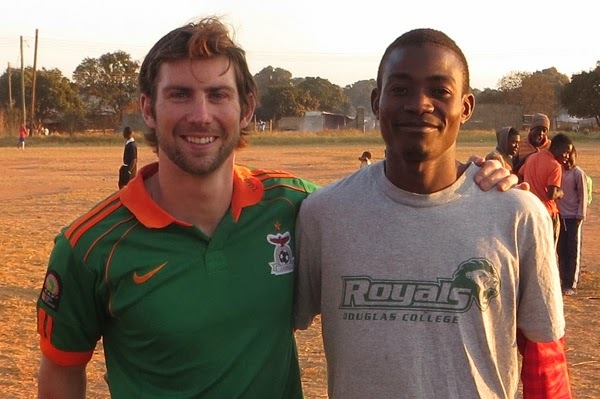 A Sport Science graduate from Douglas College, Bruce put the skills and knowledge he acquired in the classroom to good use on a trip to Zambia in early 2013. While there as part of the College’s Zambia Global Leadership Program, he was tasked with showing a group of young athletes how to deal with sports injuries. For Bruce, it was an unexpected but welcome opportunity to apply what he learned in the Bachelor of Physical Education and Coaching (BPEC) program. “One of the courses I took was sports injury assessment and management, where you actually learn some common injuries and how to tape them or wrap them,” he says. Working at a sports academy in rural Zambia, Bruce led workshops for young soccer players. He gave them hands-on guidance on how to identify and treat common injuries. “It was very rewarding and humbling. I felt like I was contributing to a cause and that I believed in and that they were actually using what I showed them,” he says. Bruce came to Douglas College as a recruit for the men’s baseball team. Before long, he had committed to the four-year BPEC program, deciding to stay on at Douglas and finish the degree once his two years of eligibility for the baseball team were up. Bruce is now pursuing a career in teaching, but he looks back fondly on his time in the BPEC program. “It was just a really good environment with stuff that I found extremely interesting, instructors I connected with and classmates whom I got along with,” he says. The CBC broadcast from New Westminster on Nov. 1 as part of its In Your Neighbourhood series. Also that day, CBC Radio Early Edition producer Shiral Tobin and CBC TV host Renee Filippone visited a Douglas College nonprofit marketing class to share tips. Check out this video of the visit. 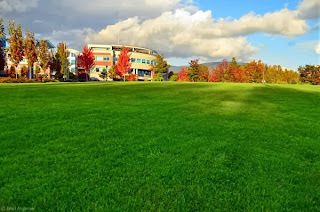 This week at Douglas College: Soccer tournament, gallery exhibit, Zambia info session and more! Bring your footie skills out to the Vuvuzela Soccer Tournament Fall 2013. Students, alumni, faculty, and staff of Douglas College are all welcome to come out and participate. More info: Douglife website. Learn more about the Zambia Global Leadership program. Applications open until Nov. 18. More info: Douglife website. The Career Planning Workshop is designed to help you with the career planning process. This is the second of three free sessions. 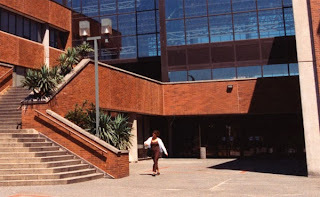 Sign up with the receptionist at the Student Services Office, New Westminster Campus, room 4600 or call 604 527 5486. Opening reception for the new exhibit Reclamation: Mixed media assemblages by Cynthia Minden. More info: Arts Events. 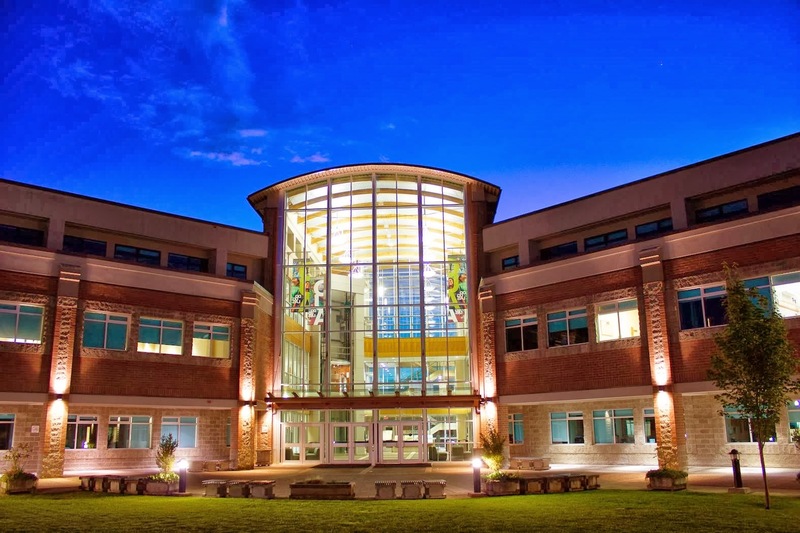 Learn about the new BA in Applied Psychology degree. Meet faculty and professionals involved with the specializations. More info: Applied Psychology. Artist’s talk for the new exhibit Reclamation: Mixed media assemblages by Cynthia Minden. More info: Arts Events. Opening performance of A Macbeth presented by the departments of Theatre and Stagecraft & Event Technology. Show runs Nov. 1-9. More info: Arts Events.